ATJ's Home Improvement | News and Alerts | Can Strong Winds Damage a Roof in Illinois? Can Strong Winds Damage a Roof in Illinois? Hail storm is nothing new for the Chicago area residents. But what about the wind? Can wind alone damage your property? How common are damaging winds and tornadoes in Illinois? Can your roof withstand high winds? As usual, answers to your questions in the blog post below. According to the National Weather Service out of Chicago, Illinois, their county warning area that serves north-central and northeastern Illinois has seen more tornadoes so far in 2015 than in any other year. Such official records for the area date back to 1950. 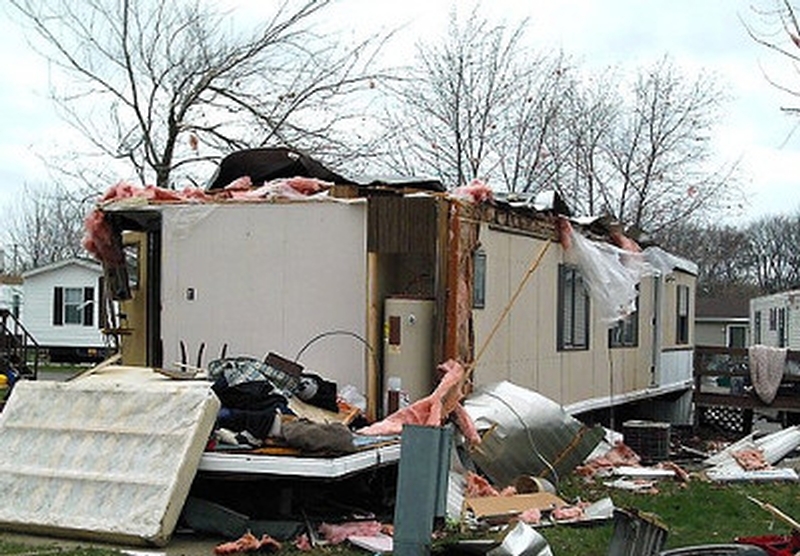 The severe weather season in northern Illinois typically doesn’t start heating up until late April, and the season generally peaks in June, but this year it started fast and furious. An unusually strong early spring storm system moved into the Midwest on Apr. 9, 2015. A northward push of humid, unstable air collided with cool, dry air draining down from the Plains. The perfect recipe for an early season tornado outbreak. The result was 14 tornadoes across the central U.S. that day, seven of which tore through northern Illinois. One of them was an EF-4 on the Enhanced Fujita Scale, which caused extensive damage in Rochelle, Illinois and surrounding areas. Depending on the way the wind blows, the shape of the roof and the location on the roof, there will be negative pressure — suction — or positive pressure — pushing, like when the wind slaps your face as you round a corner. But most wind damage that occurs on roofs start on the edge of the roof systems. Wind blowing over a roof isn’t a problem until it starts to move materials, including membrane itself or the shingles. Anywhere material is even a little bit loose, the suction of the wind is going to raise it up and then the wind can get below it and push it up. Once the underside of the roofing is exposed, rain can get in, but it also gives the wind more to grab on to. What you see in this case is a peeling effect. For example, the edge of the roofing can start to lift up and in subsequent wind events gets pushed up and over a little more each time until a whole corner of the insulation is exposed. The damage starts small and grows through repeated wind cycles, usually over time. To avoid this type of wind damage, make sure edge metal that makes the transition from the flat roof to a vertical wall is sufficiently strong for the location, height and expected wind speeds. Ballasted roofs can be scrubbed by the wind at the perimeter, moving the ballast. It’s important to check that the ballast has remained in an even layer across the span of the roof, and if not to spread it back out. When people think about wind events they think, ’oh well, it could tear the roof off my building or my roof could come loose’. But the biggest effect of wind events that I’ve seen is the potential for wind-blown debris to damage the roof. That means when inspecting the roof after a wind event, it’s not enough to check that areas are tight and that attachments are still good. Investigating what might have blown onto or across the roof is also necessary, he says. Even in hurricane areas, very few roofs actually blow off. The roofs were usually still attached very solidly to the building, but were almost shredded with cuts and punctures from flying debris.